It’s a psych folk freak out! Thanks to those who came down to Hare and Hounds last night for the Kayo Dot show – a pretty impressive percussive close to the set i’m sure you’ll agree (tin cans and buckets galore!). Piccies to come soon. The next Capsule show will be a psych folk freak out with three stellar bands who bridge psychedelia with more pop sensibilities. 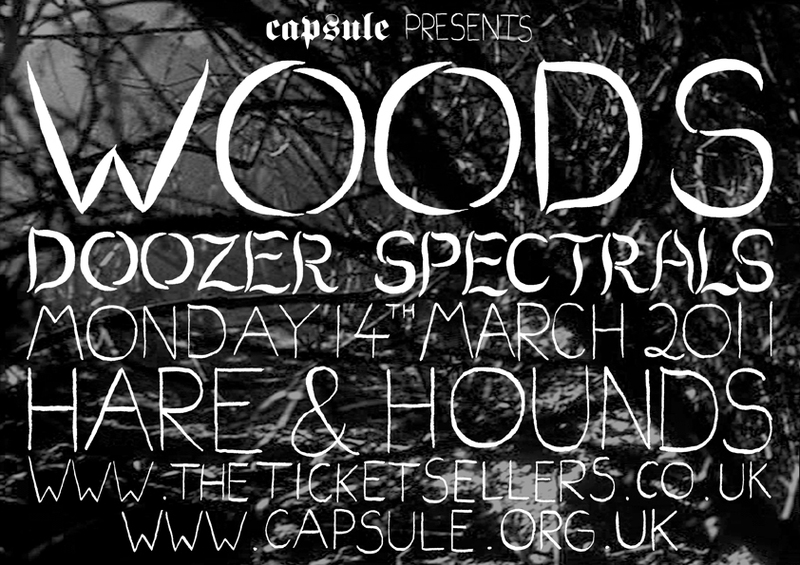 Woods have been gathering momentum since 2006 with their spooky campfire folk and noisey interludes. The Doozer was profiled in last month’s Wire, as a key player in the ‘Alternative Cambridge’ scene, full of feaky, underground experimentation. His vocal work has been likened to Syd Barrett and Thurston Moore is a fan!